One of today's most brilliant violin virtuosos gives us an album of bravura playing, show-stopping melodies and, at times, wistful lyricism. Steinbacher's formidable technique ranges across eras and styles, from the incendiary showmanship of Waxman's Carmen Fantasie and Sarasate's Zigeunerweisen, to the fearsome technical demands yet subtle beauty of the nation's favourite classical piece, Vaughan Williams's The Lark Ascending. The Méditation from Thaïs is also here, given a spellbinding performance. It's an old-fashioned kind of collection, showing off the violinist's art via unashamedly popular pieces, but there's nothing wrong with that, especially when delivered with such panache and brilliance as Steinbacher. Sir John Eliot Gardiner's has brought his period performance expertise to his award-winning Mendelssohn cycle for the LSO Live series. The muscians stand up to play, which Gardiner notes, "gives a different type of dynamism and energy... it means that the fiddles are freer in the way that they attack the extremely virtuosic lines and it gives a tremendous sense of occasion to the music making." Mendelssohn’s First Symphony, written when he was 14, is given here in a unique format, with both the original and revised versions of the third movement. The Fourth Symphony is among the best loved of all the composer’s works. 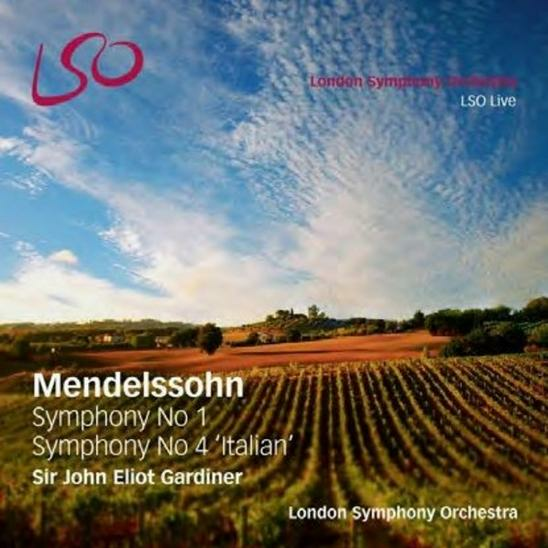 Certainly Gardiner's performance here brings out all the sights, sounds and atmosphere of Italy, as Mendelssohn found it. David Mellor's Album Reviews will return next week.